When I think of an Aston Martin, I think of flowing lines, timeless elegance and the highest quality craftsmanship. Bespoke coachwork. Brogue interior detailing that would make you feel guilty for sitting in and dirtying up. And sneakers. I definitely think sneakers, too. Because yes, there are some totally groovy and not-at-all-a-cash-grab Aston Marin sneakers coming soon. Partnering with Hogan, whatever that is, the two are creating an “exclusive limited edition luxury sneaker,” coming this fall and winter. 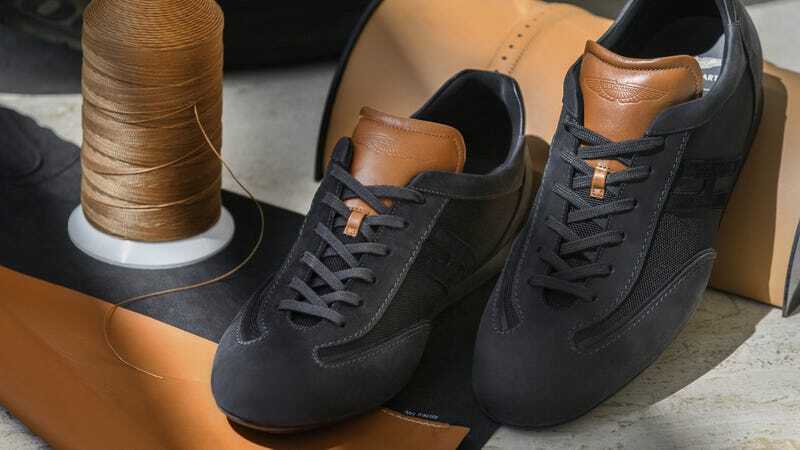 The sneakers will be made from leather and nylon. They will also feature a naturally aspirated V12, good for 600 horsepower. Haha! Just kidding. There will be four colors: Drab, Drabber, Drabbest and Black. But how will you let everyone know that you’re wearing a pair of Aston Martins on your feet? Did you read that? Aston Martin sneaker tongues! No price was announced. Only 3,000 pairs will be made. I look forward to seeing them at the next Cars & Coffee meetup.